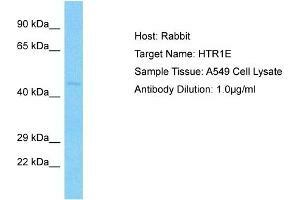 Characteristics This is a rabbit polyclonal antibody against HTR1E. It was validated on Western Blot. Background This is one of the several different receptors for 5-hydroxytryptamine (serotonin), a biogenic hormone that functions as a neurotransmitter, a hormone, and a mitogen. The activity of this receptor is mediated by G proteins that inhibit adenylate cyclase activity.